2014: my big year to throw myself heart and soul into my business. It got off to a good start. I set goals. I worked towards them. I worked hard. I was loving it. 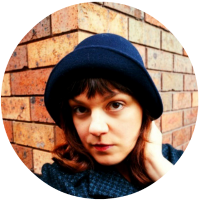 I was making and making at a rapid rate, having photoshoots regularly and sharing my love of hats through the blog, where I kept to my publishing schedule most of the time. Then one week, I just started to struggle with getting up and going in the morning. Was I just being lazy, or had I burnt myself out a bit? Or was I just getting sick? Friday morning came, and I felt like I really really couldn't actually get up. Then I remembered a few other things I had been feeling and the answer came to me. And I was right. 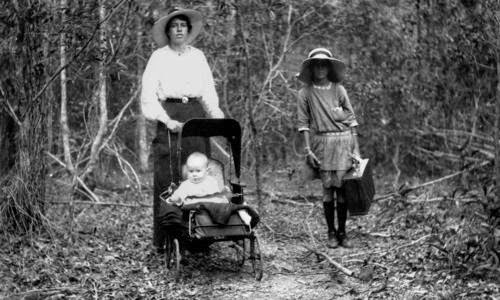 Portrait of Mrs Gertrude Steindl and baby, State Library of Queensland. The good news is that when she's done with that hat she can use it to pretend to be pregnant again. So things are going to change around here. It's only natural. I spent my first trimester almost literally doing nothing except eating and sleeping, but my energy is starting to return (although I still need a lot of sleep to avoid nausea). Hat making is on its way back into my life. Projects took a break for a while, but I'm restless and ready to get back into them, while I still can! However, much of the creative energy I have is busy creating life and a skeleton and so on, so my hat-making will happen at a slower pace. You can expect more inspiration and research posts, since I find it a lot easier to manage that kind of work. Plus I've been reading a fair bit lately (and it's not all about what's happening to me) so there will be book reviews too. And posts about maternity fashion. And possibly adorable baby-sized fedoras. Who can say for sure? 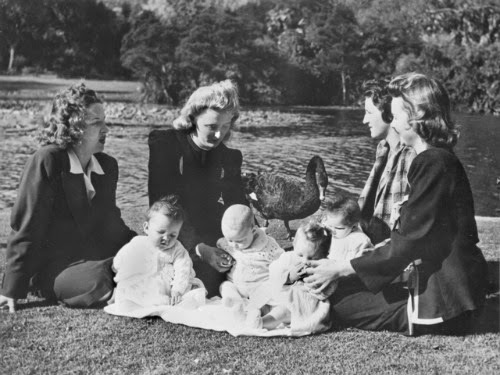 Australian wives of US Servicemen in a park in Melbourne with their children, Australian War Memorial Collection. My advice: keep an eye on that swan. I can tell you one thing for sure. I will be making for hats for myself, because I really can't be bothered to straighten my hair most mornings and it's no longer being coloured! 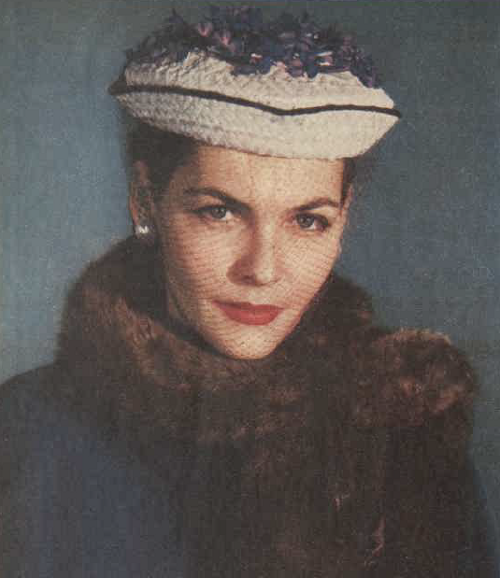 As I explored the first era of my "Hats of the Past" series, the 1960s, I found a fabulous article from 1960 talking about the current state of the millinery industry and expectations for what the sixties would bring. 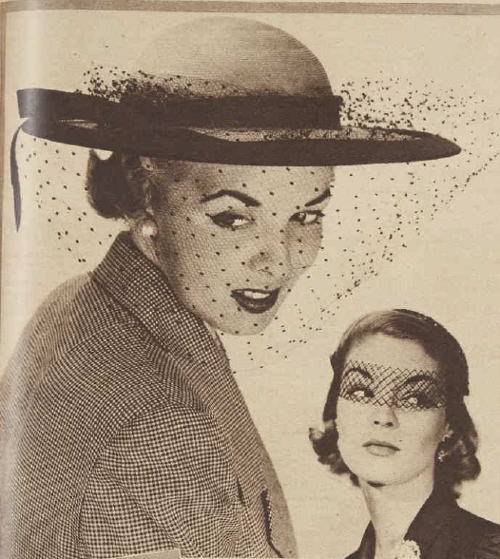 I haven't found such a convenient summary for the 1950s, but today I'm going to share a number of images and quotes from 1950 and 1951 about hat fashion trends. The above illustrations come from Mary Horden's "Paris Notes" in The Australian Women's Weekly, July 25 1951. The article's caption tells us that "Veils and flowers are back, and ribbon, too, is important as a feminine accent." I'm not much of a follower of modern fashion these days (I never was too much, but sometimes I tried). One thing I find entertaning is the need to be able to report on new trends. The need for there to be trends. It seems like we are being constantly told that something is "in" or "back" when I never knew it was out! Or when it has been "out" for only six months. What I didn't know, was how much this was already the case in the 1950s! While you do see clear changes in trends as the decades roll on, the changes don't seem to happen very quickly (to me, looking back on it) and yet the papers and magazines have to have trends to show, have to have the expertise to make us need them. It just seems strange to me. I see the shapes change significantly, and the angles that hats are worn, but it seems to me like millinery trims stay the same most of the time. When was ribbon (all ribbon?) out? That doesn't seem very convenient! Oh well. Back to Women's Weekly, this time from December 16 1950, which featured the above and below hats, suggesting that "If Santa Claus should prove a very understanding husband and slip a gift of money in your Christmas stocking to spend on "something just for you", a hat like one of these would find place of honor in your hatbox." I can't disagree with you there, Women's Weekly. 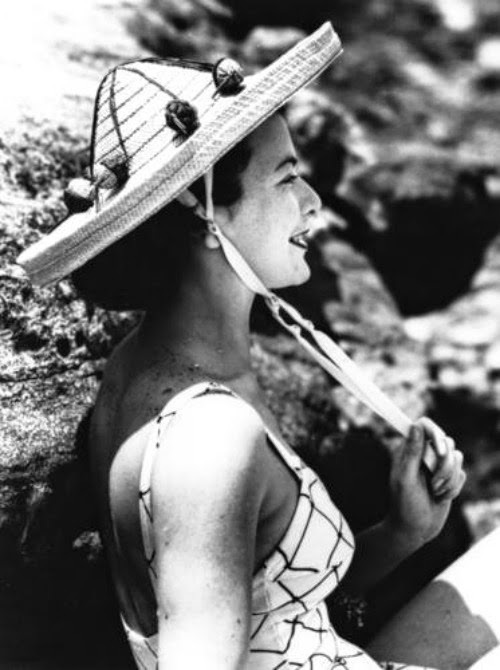 In an article titled "Foremost Fashion Item in Paris is a New Hat", from Betty Wilson, Paris correspondent for Tasmania's Mercury (October 12, 1950), we are told that "The first item in any Parisian's wardrobe is a new Spring hat. Trimmed with crazy straw flowers, and straw feathers, too, they put a brave face on the dreariest day in early Spring." Betty reports that the currently popular colours are gold, natural straws, and amber tones, and that checked, plaid and striped taffeta ribbons are common. "Height, rather than width, is the Paris Spring trend. The forward-tilted, or "prow" line is important." She mentions hat pins made with rosebud heads, in silk for spring/summer and velvet or tiny feathers for winter, which sounds like something fun to try. I've been keen to learn some jewellery making to make some hat pins, but haven't found the time, so this might be an easier way to start! I'm very interested in this idea too: "In line with the new Paris craze for transformation dresses Paris modistes presented transformation hats too. The most popular has been Maud et Nano's amusing reversible bonnet, which, made of natural straw on one side and fine black straw on the other, can be turned inside out and worn to fit the day and the mood." 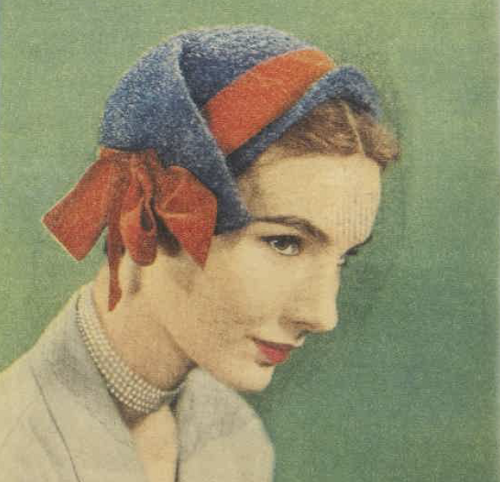 She mentions that "Gilbert Ocel's most successful spring hat was probably his "flying saucer" model - a flattish beret, which was worn straight and forward, so that it jutted out in the visor effect." 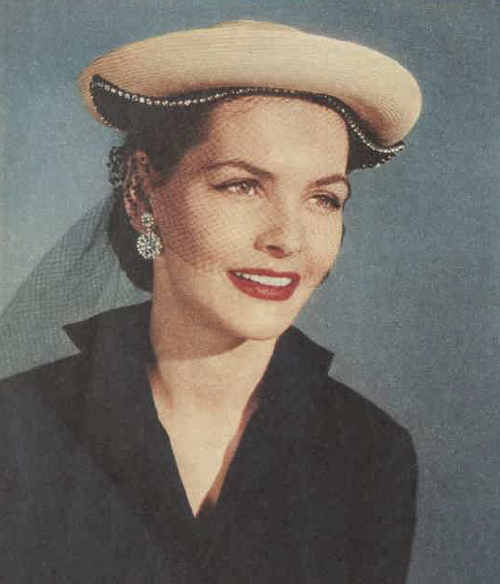 This hat gets another mention in an article in the Sydney Morning Herald on May 18th 1950 about Mrs. Selwyn Waddell, the managing director of Moray Millinery Pty. Ltd. returning from a world fashion tour. 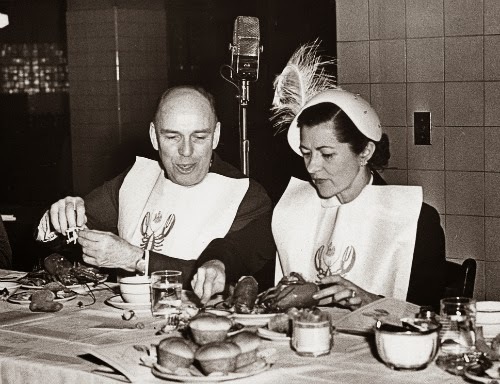 "Mrs. Selwyn Waddell wore a "flying saucer" hat from Paris and a plunge-neckline suit from Jaques Fath". She brought home thirty hats, some for herself and some to copy for her own spring collection, but said that "Everything was so expensive that I had to come home about a month sooner than I had planned." 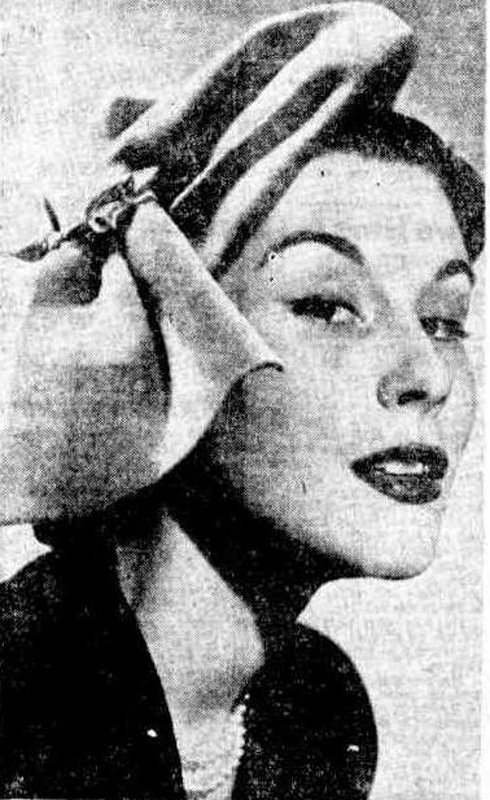 The above picture accompanies a small hat fashion update in the Newcastle Morning Herald and Miners Advocate, 25 October 1951. "The latest trick of style in the hat fashion world is an accentuated side dip, effectively displayed in this draped fur felt model. The hat is in geranium red with a gilt clasp." "Hats are on the move, a forward move." "Hats for Spring are small and chic." 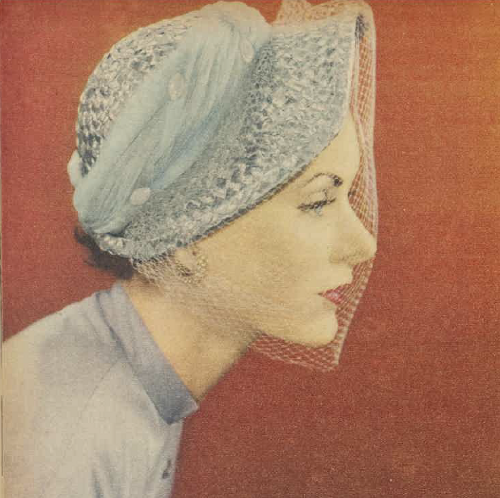 On November 21, 1951, the new update from AWW is that "A veil is the newest and most glamorous trim in millinery fashions." (Because no one was keen on veils before?) I do love the tiny bandeau veil in this picture. Some final words from AWW, 22 August 1951. 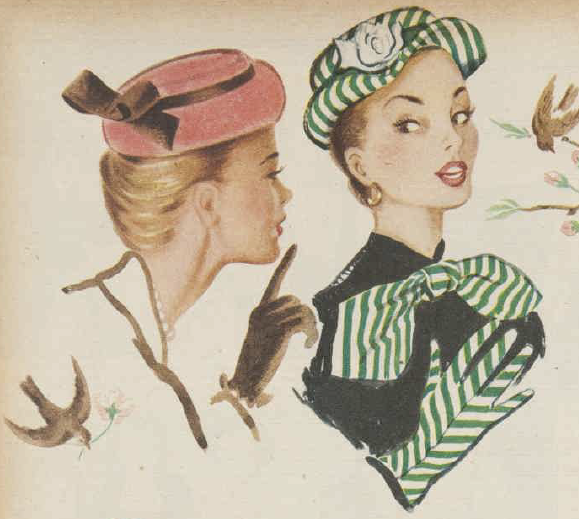 In the advice column "Dress Sense" by Betty Kemp, she is asked about the latest shapes and colors for spring and summer hats. As far as I can tell from Betty's response, practically everything is in. 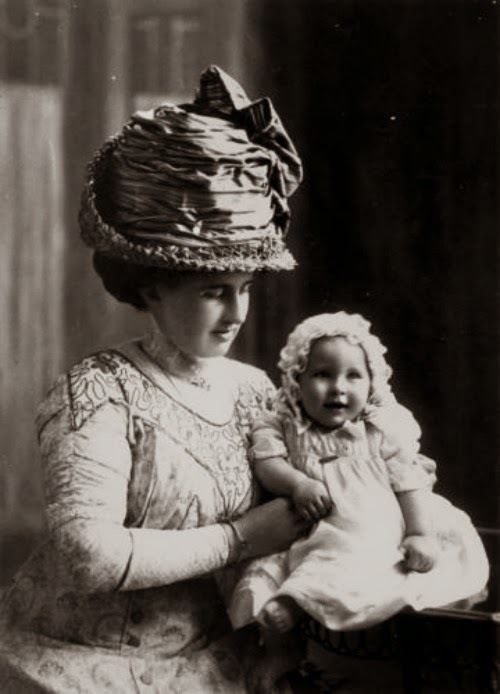 "Neat, uncluttered sailor hats, hairline-revealing hats with wide sweeping brims; high, pointed caps, flat, coolie shapes; chignon caps, floral hats and caps, and an old-fashioned mushroom shape are all well represented in new millinery collections. Veils are in vogue. Some just cover the eyes, others the entire face, and in some case are jewelled or sequin-trimmed. Most liked colours are yellow, soft pink, lilac, and, as always, navy, black, and white. White looks newest with a colored veil." My takeaway lesson from all of this is that it was just as confusing to keep up with fashion trends in the 1950s as it is now! At least when it comes to hats. Still, I don't think a very understanding Santa could go wrong with any of these beauties. Any of these you'd like to see me make? 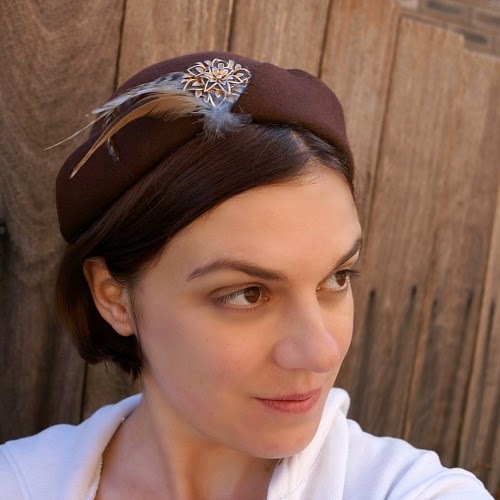 I'm finally ready to tackle the epic challenge that is the 1950s for my Hats of the Past series. I did a lot of research and was blown away by the volume and complexity of the projects I wanted to tackle, both in terms of hats to make and stories to share. It was clearly more than a month's worth, and I was a little burnt out by throwing myself completely into the 1960s, so I took a break and removed some restrictions from my plans. To get myself back into the mood, I've been listening to some 1950s music, watching movies of that vintage, and reviewing the pictures I found and sketches I did when in full swing a month ago. I listened to 1960s music during March, but I was able to just look at my music collection and find plenty of material (mostly Beach Boys, The Band and Donovan). For the 1950s, I had hardly anything. Luckily, the internet is full of lists and I trawled through, looking mostly for songs I already recognised. It was lots of fun rediscovering songs I know and enjoy but had not listened to for years. Some of the favourites on my fifties playlist include: Chantilly Lace (Big Bopper), Teenager in Love (Dion & the Belmonts), Summertime Blues (Eddie Cochran) and All I Have to Do is Dream (The Everly Brothers). My movie watching is entirely based on what classics happen to be on the ABC in the wee hours of the morning, or on GEM in the middle of the day. Recent ones I've watched that are new to me are Texas Carnival (1951), Dial M for Murder (1954) and Tonight's the Night ("Happy Ever After" according to IMDB, 1954 - you can't have too much David Niven). I've got a few more recorded, plus it seems like a good excuse to rewatch old favourites like How to Marry a Millionaire, Designing Woman and Sabrina. 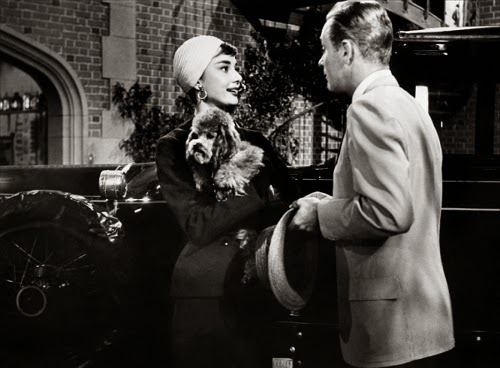 Audrey Hepburn in Sabrina, 1954. This outfit is pretty much perfect. My research has included looking at as many photos of hats as I can, through museum websites and vintage selling websites. 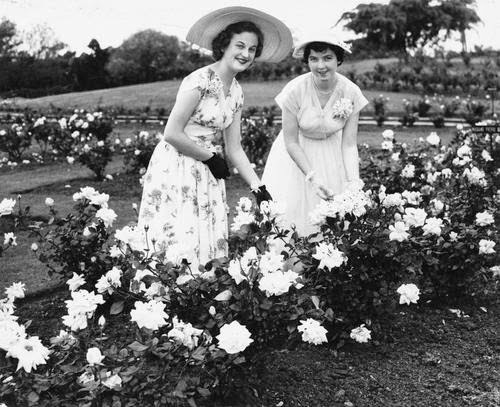 The Australian Women's Weekly archive has great photos, sketches, some patterns, and advice about new styles and finding the right hat for the occasion and outfit. I'm going to take a research trip to Lithgow library soon, as it turns out to have the biographies of two fifites milliners I'm particularly interested in. Flickr commons is a great starting point for vintage photos out of copyright, and it includes a number of Australian collections. And of course, the love of my hat-researching life, British Pathe. They recently added their entire collection to youtube, but I still prefer browsing through their own site. One thing I want to spend more time doing in general, and in this series, is actually designing hats to go with specific outfits I own. As a self-appointed ambassador for hat-wearing, I want to wear hats more often. In the spirit of self-promotion, I want to wear my own hats (plus, if I wear a vintage one, people I meet inevitably ask if I made it, and are disappointed when it isn't). But everytime I dress up, I discover I don't have a hat of mine that matches anything I own! So it's time to change that and do some more making for me. So while I get on with the making and the stories, I'd love to hear about your inspirations. What are your favourite fifties songs and movies? 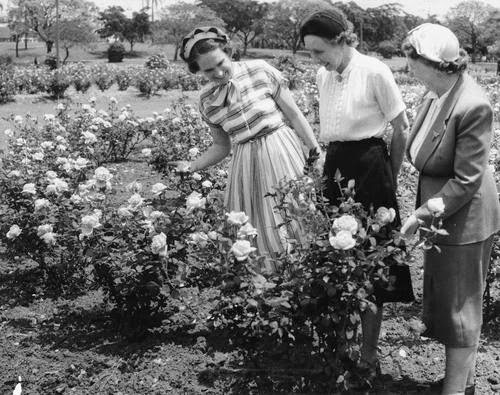 What are your favourite places for inspiration about 1950s fashion and style? Hey there! Just a quick note today to let you know that I've joined instagram recently. I'm @tanithrowan and I've added the cute little instagram guy to my happy family of social media icons on the right there, so you can get to me that way too. I'm still finding my feet, but I already like instragram approximately eleventy-billion times more that twitter. I just haven't really taken to twitter. 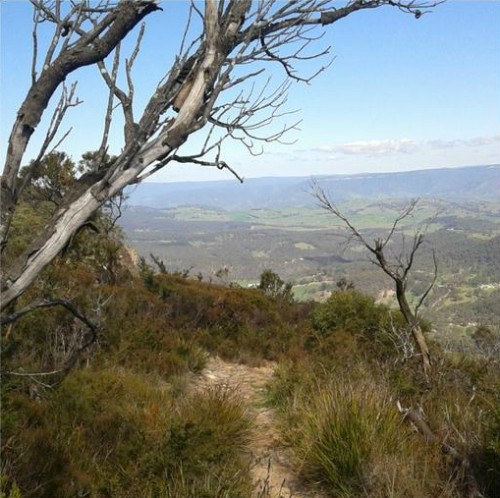 My instagram includes some photos from the blog, but also other life stuff, like some beautiful blue mountains views as I start going on more bushwalks. I'm also planning to start taking more "in-progress" pictures as I work on my hats, which before now I haven't been in the habit of doing. If you are reading this and you are on instagram, I'd love to know so I can follow you. I'm also keen to hear any tips you might have for getting the most from it. I have to keep reminding myself to put in hashtags, but I'm still working that whole thing out!